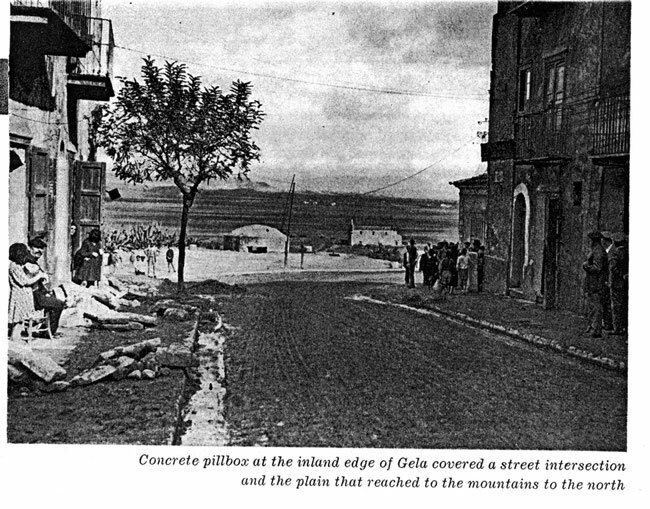 Does anybody have a good 1940s map or aerial reconnaissance photos of the town of Gela (Sicily) that can be used for map-making in Combat Mission? ... Got way carried away and made this map! I'm trying to create a couple of scenarios inspired in the fights after the US landings in Gela. The above map's only hope is to have a "flavor" of the town, because I don't have that many pictures or a decent map of the layout of the town. One of the Italian pillboxes/bunkers at the north edge of Gela. That's a HMG ... and it is no slouch. A birds eye view of the pillboxes in the northern edge of Gela. Yes, I went overboard with their number (5 total) and their mutually supported fields of fire. A company of US Rangers will be taking care of those pillboxes. The scenario is ready for my personal use (I feel bad releasing an scenario with no briefing and scoring, but you can have it by the end of the week if you are interested), but I will be more than happy to make another map and scenario if somebody can help me with some maps or photos. "The camouflaging of pillboxes sited to deal with landing forces has, not surprisingly, been the object of a great deal of effort on the part of the enemy. Great care was taken to blend these pillboxes--mainly made of concrete--into the general ground pattern. The profusion in the island of walls, small houses, and huts, has helped this form of camouflage. In one section (the Pachino area) several pillboxes were covered with complete huts made of straw. One pillbox overlooking a road junction was an actual small House, reinforced with concrete and having a weapon slit just above ground level. Examples seen in another area were straw-roofed and sited on slopes in the vicinity of limestone ledges, which made recognition difficult. They had straw "blinds" to cover the weapon loopholes. One pillbox noted and photographed was sited against a wall, and an attempt had been made with paint to simulate the pattern of the stone wall. Many of these pillboxes were revealed by the poor siting of their defensive wiring. Instead of being sited to blend with the ground pattern, wire was taken haphazardly across fields. Many of the pillboxes were never used." "Study of enemy camouflage in the Sicilian campaign tends to confirm the impression gained in the closing stage of the North African campaign that enemy methods in this direction have improved. The Germans, generally, have made good use of available cover and terrain, while the Italians, no doubt prompted by their former ally, seemed to have taken a serious interest in camouflage, with mixed success. The fieldcraft and camouflage behavior of individuals, particularly Germans, was very good and full use was made of the many opportunities offered by the type of country concerned." "There were pillboxes all over the island, sited to cover roads, approaches, valleys and stream crossings. While some were poorly placed, many were well located with excellent fields of fire. Concrete was the usual construction material. Three general types were found embodying a circular form with 18-inch walls and a 2-foot roof, to the largest type with a circular wall 14 feet across, 4 feet high and 5 feet thick, topped by a domed roof 9 1/2 feet high in which the concrete tapered to a thickness of 3 1/2 feet at the top. Frequently they were extensively camouflaged, at times with-brush, straw, hay or some other material from the immediate surroundings. Others had houses or huts built over them. In open fields, a number were found camouflaged to represent straw or hay ricks -- a poor camouflage, as the material caught fire and turned the pillbox into an oven."